A New Map of South America drawn from the latest Discoveries. 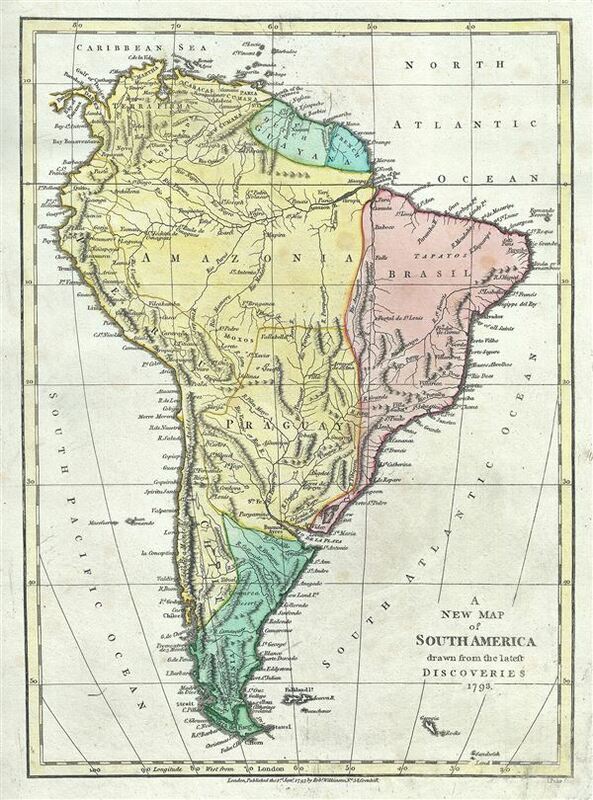 This is a lovely 1793 map of the South America by Robert Wilkinson. Wilkinson's map covers the entire continent from Panama and the Caribbean to Tierra del Fuego and the Falklands Islands, inclusive of South Georgia Islands and a few other minor Antarctic islands. Each region is color coded to identify its colonial overlord, with Spain in yellow, Portugal in red, and French and Dutch colonies in green. Despite several hundred years of exploration, at the end of the 18th century, much of the interior of South America, aside from the Andean coastal regions, remained largely unknown. The vast expanse of tropical rainforest between the upper Orinoco and the Paraguay River, including the great Amazon itself exhibits little detail. On the Amazon, Wilkinson has identified several villages, sites, and tribes, many of which are drawn from the Orellana expedition, which miraculously navigated the entire length of the Amazon in the 17th century. Also of note are more speculative sites, such as Lake Parima, near Guyana. Lake Parima was first identified by Sir Walter Raleigh in the 16th century - though he admittedly never saw the lake himself. Raleigh associated the lake with indigenous legends of Manoa and the supposed site of El Dorado. Many early maps actually show 'el Dorado' on the shores of Lake Parima, though Wilkinson curiously does not. However, his rendition of Lake Parima is vastly smaller than most previous examples from the late 18th century - even those by other English cartographers such as Laurie and Whittle – suggesting a significant advance in regional cartography. The reality of Lake Parima and the Manoa is based upon Raleigh's misinterpretation of local trade networks. The Manoas were a river trading tribe based in the Amazon. Each year during the rainy season flooding on the Orinoco and Parima rivers would create a large flood plain and open channels of trade between the two otherwise unconnected regions. Raleigh misinterpreted these watery trade channels as a great lake and attached them erroneously to the El Dorado legend. This map was engraved by I. Puke and issued as plate no. 44 in the 1792 edition of Robert Wilkinson's General Atlas. Very good. Original platemark visible. Blank on verso. Overall toning and foxing.